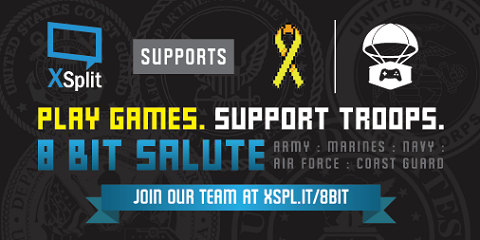 XSplit supports the upcoming 8-Bit Salute Military Appreciation Month event for May 2016. We will be providing FREE Premium licenses to qualified participants and also join the initiative by live streaming games ourselves during the event period. What is 8-Bit Salute and why are we supporting it? 8-Bit Salute is an annual charity event run by Operation Supply Drop, an organization founded in 2010 to aid active duty service members and veterans. They support veterans through three major programs: The Teams, Thank You Deployments and The Teams. The most notable of the programs are “Supply Drops” which are video game care packages delivered to active duty Veterans deployed, in hospitals or on military installations around the world. The best part is that OSD supports US, NATO and ANZAC veterans. How is XSplit supporting 8-Bit Salute? XSplit is supporting the 8-Bit Salute event two ways -- first, we are providing participants with FREE XSplit Premium license codes so they can make the most out of their live streams, and second, we are joining the month-long event ourselves! For the XSplit license, there will be a free 1-month license for every qualified participant and a 3-month Premium license for those who can raise more than $100 in donations. To spice things up a bit, we will host a contest during the event month where those who donate $25 or more to our team (Located Here) will be entered into a drawing for two XSplit Lifetime Premium licenses. The winners will be chosen and announced at the end of the event period. The easiest way is to Sign Up and Participate in the event. If you are a gamer, and you love to stream, then there's simply no reason not to join this endeavor. Finally if you are part of our stream teams through Twitch and Hitbox, then we are counting on your involvement for this. You're not only supporting us in our participation but you're supporting a good cause.